Over the last month we have been looking at the data on the primary causes of death recorded by the Ministry of Health for the 29,204 people who died in New Zealand in 2009. 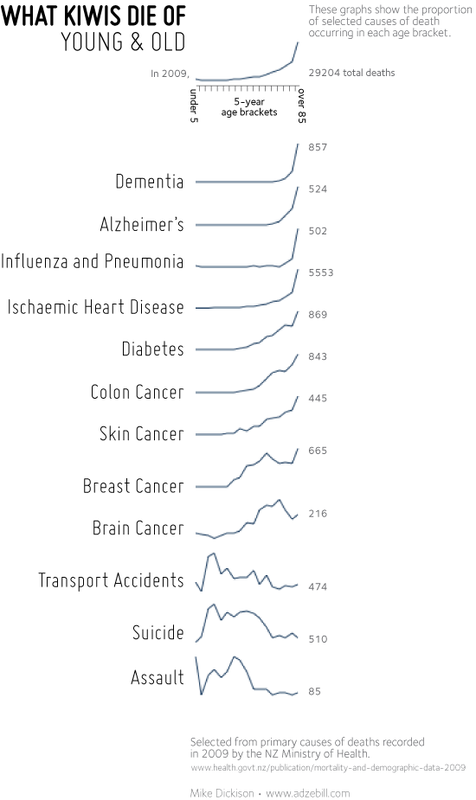 First we looked at what people thought they would die of, and then we looked at differences in the causes of death recorded for men and women. Accompanying each post was a gorgeous infographic by Mike Dickison. I was interested to see that the number of people who died under the age of 80 was really similar to the number of people over 80 (14,371 under 80 versus 14,833). Striking also to see the greater numbers of males dying than females for all age brackets, except the over 80’s. No surprises for dementia and Alzheimer’s, with the graphs skewed towards the upper age brackets. And probably no surprises that the deaths from traffic accidents peaks for people in their the 20’s. But I’m blown away by the data on assaults. I would never have expected there to be such a huge peak for children, similar to the number of people assaulted in their 30’s. Shocking. To see if people’s perceptions tallied up with reality, again we took to social media and asked people what they thought was the major cause of death for different ages*. So what did the Kiwis we surveyed think? Results are summarised in the slideshare presentation below. People were pretty much spot on with the major cause of death for children under five being accidents. But interestingly, while of our survey respondents were right thinking traffic accidents were the major cause of death for people on their 20’s, the number of people committing suicide is almost the same (98 versus 95). For people in their 30’s the major cause of death is cancer, but less than 20% of our survey participants picked this option. More popular choices were accidental death and transport accidents (with about 30% of the votes each). For people in their 40’s, cancer is again the biggest killer, by quite a margin. But again only 20% of our respondents picked this option. The most popular choice was circulatory diseases (heart attacks and strokes). I wonder if this misperception around cancer means those in their 30’s and 40’s are more less likely to miss early warning signs. * We used Twitter, Facebook, and email to entice over 100 people to fill out our survey using the SurveyMonkey website. Like all online surveys, ours should not be considered representative of the population of New Zealand, but rather of people on social media who were happy to fill out our survey. This post is the second in a series inspired by the Guardian newspaper’s infographic ‘What we die of’ and is a collaboration between myself, chief number cruncher Dr Paul Gardner and data visualisation extraordinaire Dr Mike Dickison. Dr Paul Gardner (@ppgardne) is a Royal Society of NZ Rutherford Discovery Fellow and Senior Lecturer in Bioinformatics at the University of Canterbury’s School of Biological Sciences. He gets very excited about RNA. Dr Mike Dickison (@adzebill) is a freelance information designer with a PhD on the evolution of giant flightless birds. He quite likes ukuleles too. Dr Siouxsie Wiles (@SiouxsieW) is a Health Research Council of NZ Hercus Fellow at the University of Auckland’s Faculty of Medical & Health Sciences. She is rather keen on nasty bacteria and anything that glows in the dark. The death of our small children by assault is frightening. We need to do something about this Yesterday! I’m horrified by the 0-5 Assault peak. I’ll lose sleep over that. Will send this to my Mum who works for CYF. Thanks everyone for dropping by and commenting. The assault curve is awful, but to be far, is based on a small number. What we need to do is see if 2009 was an odd year or whether this is a general trend. Brenda, we’ll see what we can find on HAI’s and medical misadventure. Not sure if we will be able to tease them out from the data. so for the 20 year olds about the same number died by transport accidents as by suicide?? that is really sad. In the summary there are 12 such deaths, in the coding only 11. There are approximately 300,000 children under five. That’s a death rate of 1:25,000. In 2008 there were 2 such deaths in total in under fives. In 2007 there were 7. For what it’s worth, for deaths associated with medical injury, most of these are not given an ICD code and are therefore rarely included in official stats. From analysis of MOH data I undertook in the early/mid 2000’s the risk of a child under 14 dying from a preventable medical injury was 6x more than dying in a car crash. Thanks, Ron. Gosh it’s sad to see them listed like that. Recognition of some good work. Hi Ross, thanks for letting us know. That’s great!